Tiger is a neighbor cat, and very much reminds me of a cat I had many years ago. Just look at those whiskers! 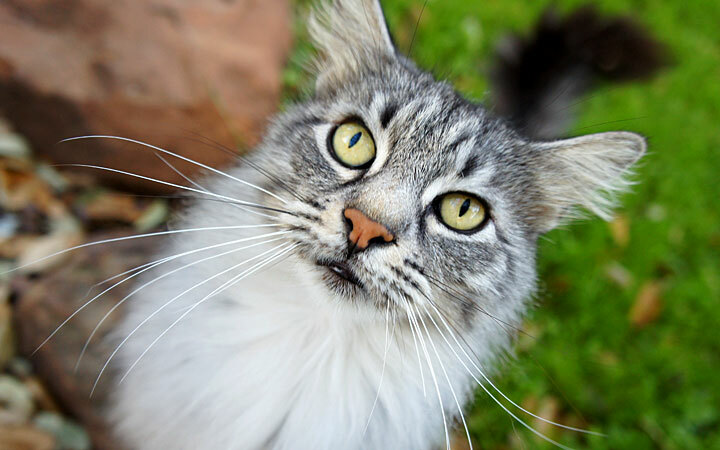 This entry was posted in Pets, Wordless Wednesday and tagged cat, Tiger, Whiskers, Wordless Wednesday. Bookmark the permalink. He is beautiful. Lots of fluff! But very sharp claws! That Tiger is quite the looker! Yeah, but he lacks one of those gorgeous fedoras like you have! Tiger is quite handsome! Thanks for sharing his photo. Have a purrfect day! Thank you for stopping by. I love taking photos of my pets, and all pets! Oh he is adorable! What a great photo. Awww Ann – thanks! He was not accustomed to having his photo taken like my guys are, hence the slightly tilted ears. He flinched every time the shutter snapped. I’ll keep taking his photo when he’s around. Maybe in time I’ll get him used to the camera!